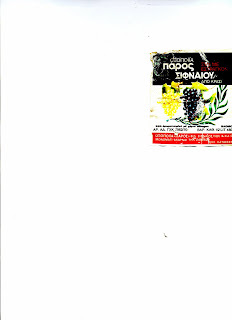 The image is from a plastic bottle of Greek Tarragon Wine Vinegar. Red wine. It has sat on the shelf of a defunct mom & pop grocery for a decade. Maybe 15 years. The price on the label read: $1.59. 12 ounces of vinegar. This is either the last or one of the last 2 or 3 bottles. When it's gone I will never be able to make red onion, cucumber and tomato salad again. At least not as good as with this vinegar. As I gaze, wistfully at the label, knowing it's goodness and feeling feeble at not being able to impart to the reader the extraordinary character of this flavor, I sigh. The bottles were on the bottom shelf. Away from the ugly florescent lighting of the store. The bottles had their sides squeezed together. Not from a vacuum. I can't know why this was so. Once opened, the liquid has to be strained. The tarragon stem (and leaves) has dissolved to a near mush in the vinegar. It has to be removed. It would tasted almost gooey on the tongue. Can't have that. This is the only bottle of it's kind anywhere on earth. Nobody sets wine vinegar aside to age. Not in commercial volumes, they don't. This market also had rose petal jam that had aged similarly. The flavor was so sophisticated. Better than fine wine in some ways.